Teaching assistants and part-time faculty at the University of Toronto and York University are on strike. They account for an estimated 60 percent of the teaching that goes on on these campuses. 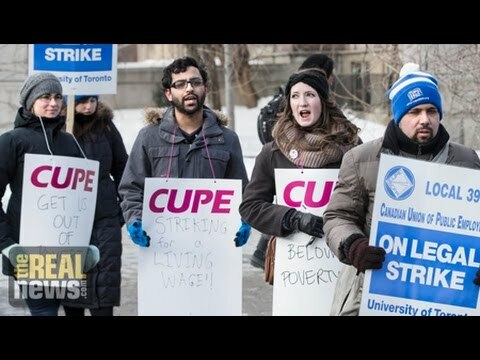 After nine months of negotiations, University of Toronto has offered them $43.97 an hour. That sounds pretty good, eh? Here with us to unpack why they’re still on strike after months of negotiations is Omar Sirri. Omar is a PhD student in political science at the University of Toronto. He’s also a member of the outreach team for the strike committee CUPE 3902. OMAR SIRRI, PHD CANDIDATE, POLI. SCI., UNIV. OF TORONTO: Thank you for having me. PERIES: So, Omar, union members decided to go on strike Monday after 91 percent of your membership rejected the offer that was tabled by the university. This is after months of negotiations. That 91 percent sounds rather historic. Is it? SIRRI: It very much is. It very much as. We’ve been out of a contract now for close to nine months. In November of this last year, our membership voted in the largest turnout for an academic local union in Canadian history and voted overwhelmingly to endorse [strike (?)] action, which then led to the final hearing, in which negotiations should have taken place. And a limited number of dates was set by the university administration to negotiate a final agreement, which virtually all took place in the final week, the 11th hour, in which literally beyond the 11th hour the university administration put forward a deal that was endorsed by our negotiating team and then put forward to our membership at a meeting the next day. And at that meeting, where more than 1,000 people turned out for that meeting, again, more than 90 percent voted to reject that deal and to therefore be immediately on strike. And the reasons for that are many, but ultimately the deal was proven to be wholly inadequate by our membership, ultimately because, though, as you mentioned the wages were proposed to be increased, the issue for us at this moment is not the wages. It has to do with the guaranteed minimum funding package. PERIES: Okay. So what’s in the deal, Omar? SIRRI: Well, the proposed agreement that was voted down is effectively dead, so there is no deal. The issues that are on the table currently have to do with the $15,000 guaranteed minimum funding package, which falls, currently, at more than $8,000 below the poverty line for the city of Toronto. This funding package has not increased in more than 70 years, has not seen an increase to it, and yet the cost of living has skyrocketed here in the city. And so our members simply cannot afford to be living on $15,000 a year anymore. PERIES: Now, your union includes not only graduate students that are doing part-time teaching, but it also includes part-time faculty? SIRRI: That’s correct. We have a second unit. So the unit one is currently on strike. You know, one includes teaching assistants, course instructors who are part of the university, exam invigilators, and a few other groups. Unit three includes essentially the sessional faculty, who I think you’re referring to here. The sessional faculty have a proposed agreement currently, a tentative agreement, from the university administration that they’re currently voting on. So that unit of our union is currently voting as to whether or not to accept that agreement. And we’ll find out soon enough if they do or not. And if they do not accept it, ultimately they’ll join us, we hope, on the picket lines. PERIES: Omar, give us a sense of the number of people affected by the strike. SIRRI: So, in terms of those who are on strike, unit one members are minimum 6,000 teaching assistants, course instructors, and others, who are effectively on strike currently and have been since Friday. And a thousand members are part of the unit three sessional faculty, who are currently voting on that proposed agreement. Of the 6,000–so, together our union makes up more than 65 percent of the teaching that goes on at our University, at the University of Toronto. PERIES: And there’s almost 84,000 students at the University of Toronto, and perhaps a few more, probably about 50,000 other the faculty and staff. SIRRI: We have the largest institution in the country [incompr.] And the two largest universities in the country are currently–their teaching assistants are on strike, us and our friends up north of the city at York University. PERIES: Alright. Now, these negotiations are going on for months now, and there’s been no capitulation on the part of the university whatsoever. Why is this so? Why are they really standing their ground without making some concessions here? SIRRI: It’s a very good question that I think should be put towards the university administration. They have refused to return to the negotiating table after many days of the strike, and they’ve known for months that this has been our issue that we’ve been considering, the minimum guaranteed funding package. And I think part of the reason as well is perhaps [they think they can (?)] wait us out for this. We haven’t been on strike for 15 years, so it’s quite historic in that sense. And, finally, I think the university administration is realizing, and they will realize eventually with the strike action, that this funding model is not sustainable and they simply haven’t spent the time to figure out the right solution. And they’re going to have to. PERIES: Now, unlike York University, where the faculty and the whole university has more or less agreed that there would be no crossing of picket lines, at University of Toronto the class are still in session. Is that so? SIRRI: That’s correct. That’s correct. One could say we have different labor cultures, frankly, here between the two institutions. York has a different history when it comes to labor action. Their last strike lasted, was prolonged for perhaps, I believe, three months, went on for 12 weeks, and really disrupted the courses and the curriculum up at that York last time. And so university administration at York has closed down the university until a deal is reached. From my understanding, they are closed. They are negotiating, at least, still. And the president there has called for negotiations to continue, which is radically different than what has happened here. I don’t think the administration’s here was expecting and were perhaps so out of touch with the student body and the graduate students that they weren’t expecting this, and so, when the strike action was endorsed overwhelmingly, were perhaps caught a little bit off guard and is now trying to find a solution. PERIES: And so what are the next steps as far as your local is concerned? What is in the works for actions? SIRRI: Well, the picket lines today are strong. I believe it’s -20 degrees outside. It’s quite frigid. And yet we’ve seen the numbers are robust, as robust as they were on the first day. And they’ll continue. We had large rally today in support from the steelworkers today in the morning. Tomorrow we have a massive rally–not planned by us, frankly, but planned by the undergraduate student union here, who are fully behind us in our call for a fair offer from the University. And that rally will be tomorrow, and it will be a strong showing. So our picket lines will be strong through next week and the week after and the days ahead, as well as we hope to–we continue to call for the university administration to return to the negotiating table and hammer out a deal. We’re ready and we’re waiting and we’re willing to get back to the teaching of students. PERIES: And what other pressures are they feeling? Is there other solidarity pickets going on to support your actions? SIRRI: Indeed. Indeed. Not only have we had our friends from York come down and join us. I was on a [fauteille (?)] with a person who’s keen to highlight the fact that families are from York, families are being affected, students who are trying to raise families on these salaries. And so another family-oriented rally will be planned for tomorrow, a march towards Queens Park, where is the seat of our provincial government here in Ontario, as well as the steelworkers solidarity rally that happened this morning. And we’ve also had a number of politicians from the New Democratic Party, the NDP, show their solidarity by joining us on the picket lines. PERIES: Right. And from what I understand, the last time you went on strike, the strike lasted almost three months. SIRRI: So, at York University, that’s exactly what transpired. The last time we were on strike was in 2000 and was when we achieved–the guaranteed minimum funding package was set in place because of that strike action. So we know that, the benefits of taking this action, and we expect to be successful in it. SIRRI: Thank you so much.